Without stamina. At a first glance, the specs of the HP computer sound interesting. However, it turns out quickly in practice that the built-in hardware is very power-hungry. As a result, the battery life of the notebook is poor. 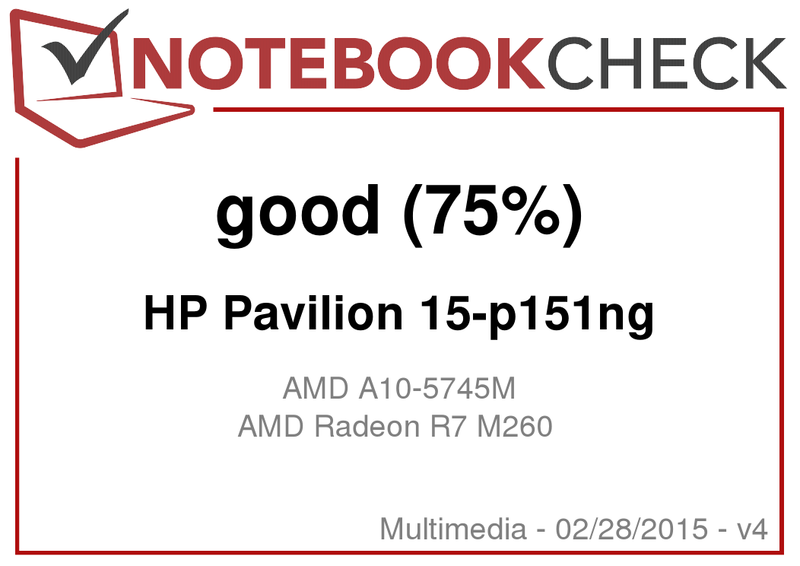 In 2014, the 15.6-inch all-rounder HP Pavilion 15-p008ng went through our tests. It featured a Core i5-4210U processor and a GeForce 840M graphics card. 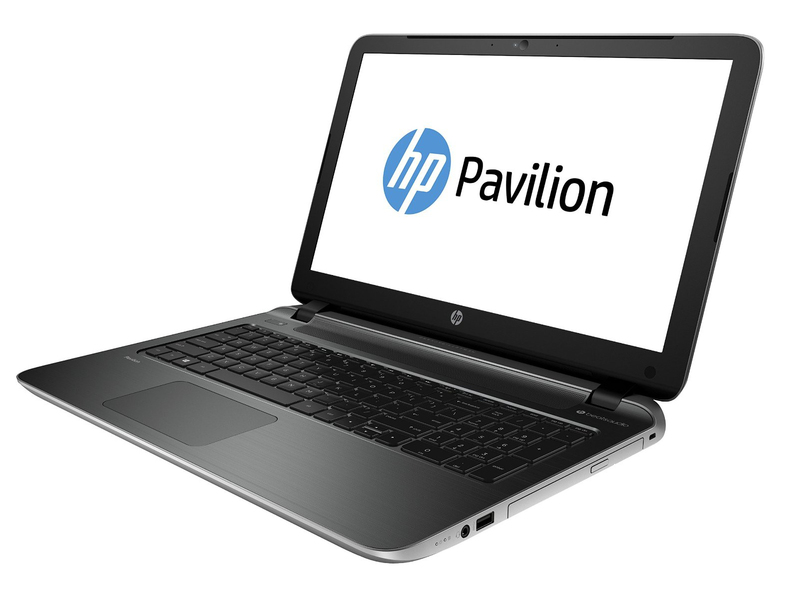 Now, we are delighted to meet a sibling with the Pavilion 15-p151ng. 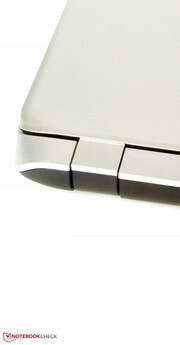 While both models use the same case, their innards are different. The Intel processor has been replaced by an AMD APU, and the GeForce graphics card by a dedicated AMD GPU. Our review will reveal whether the AMD components are advantageous or disadvantageous. 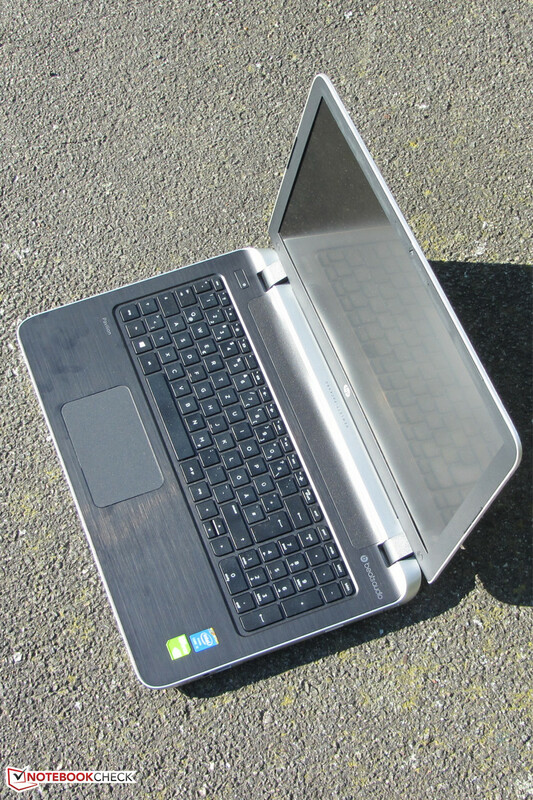 The Pavilion has many competitors in the price range of roughly 600 Euros (~$650), for example the Acer Aspire E5-571G-520X, the Asus X555LN-XO112H, and the Toshiba Satellite S50-B-12U. Since the two Pavilion models use the same design, we will not cover case, connectivity, input devices, and speakers here. Information about these is available in the Pavilion 15-p008ng review. Note: The pictures in the right column stem from the Pavilion 15-p008ng. 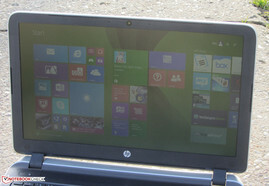 HP equipped the Pavilion with a matte 15.6-inch display, which provides a native resolution of 1920x1080 pixels. Its brightness is very good (279.8 cd/m²). The displays of the Acer Aspire E5-571G-520X (226.2 cd/m²; Full HD) and the Asus X555LN-XO112H (184.2 cd/m²; HD) cannot keep up in this aspect. However, the Pavilion is outperformed by its sibling (329.4 cd/m²; Full HD). 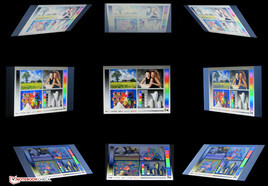 Contrast (366:1) and black value (0.8 cd/m²) are not convincing. The same is also true for the Aspire (290:1; 0.77 cd/m²), the Asus (86:1; 2.2 cd/m²) and the sibling (336:1; 1.02 cd/m²). 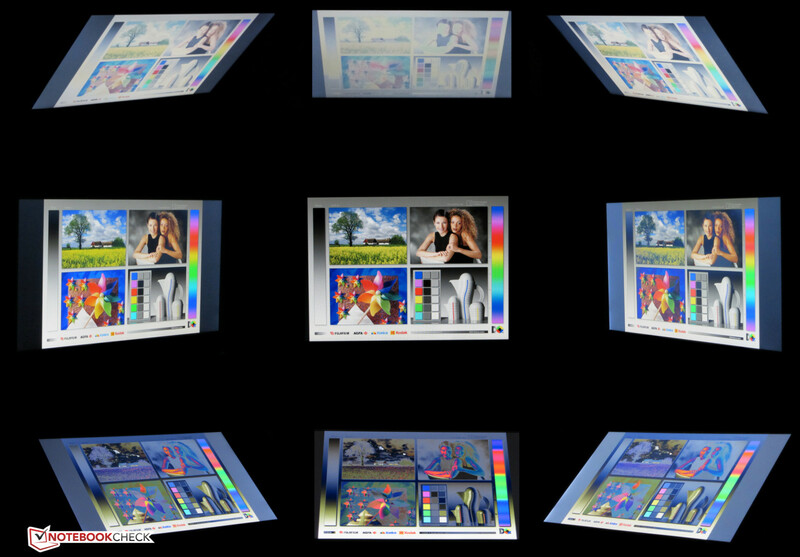 The display does not cover the AdobeRGB and sRGB color spaces. The coverage is about 51% (AdobeRGB) and 68.5% (sRGB), respectively. We did not like the colors of the display. The average DeltaE 2000 deviation is about 13.19. A value smaller than 3 would be desirable. In addition, the display is bluish. 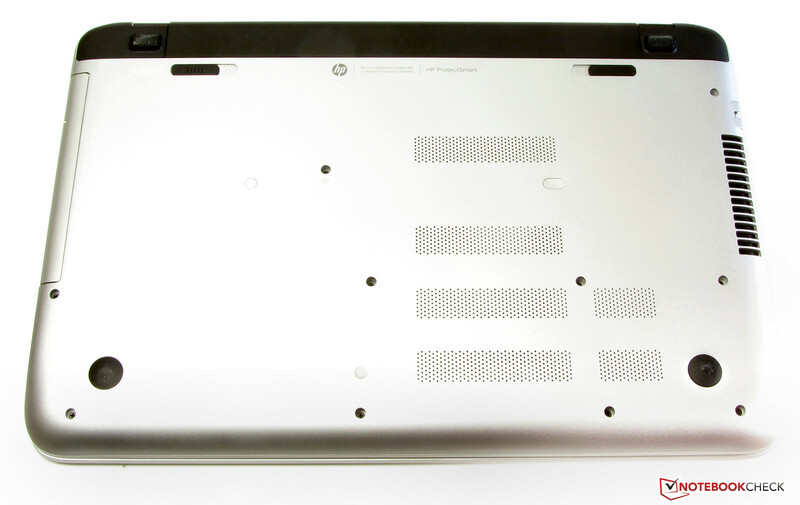 HP decided to use a TN panel in the Pavilion. This kind of panel only has narrow viewing angles. In vertical direction, the viewing angles are quite big and several people can look at the screen simultaneously. Changing the vertical viewing angle to the screen quickly leads to image distortions. 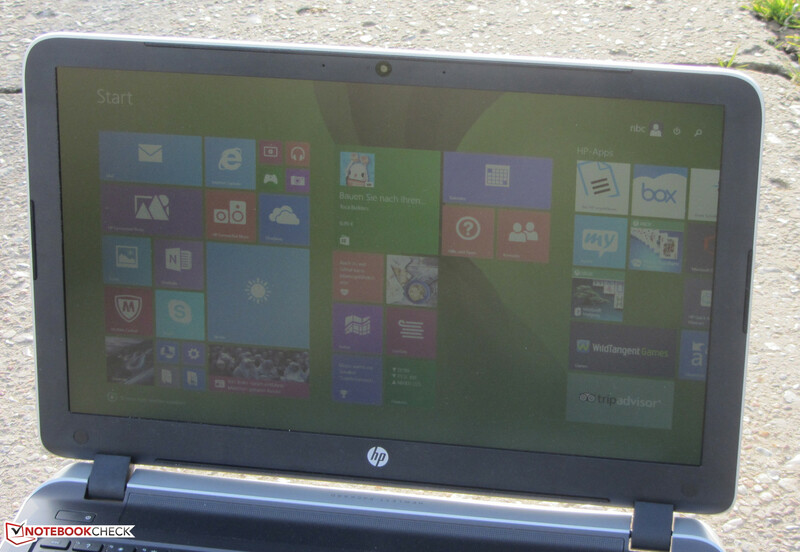 The notebook can be used outdoors. 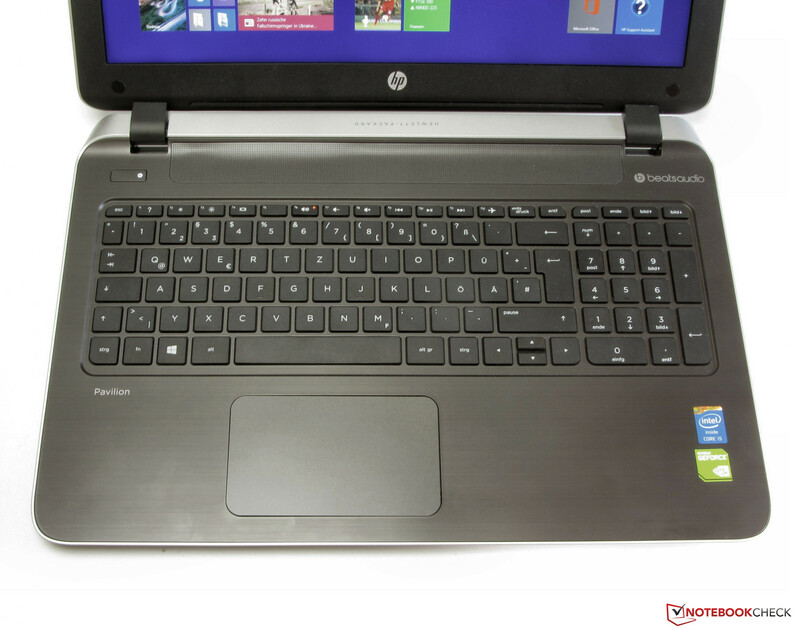 The Pavilion 15-p151ng belongs to the cheap all-round notebooks with a size of 15.6-inches. The processing performance is absolutely sufficient for everyday tasks. In addition, the computer can run some games. The test model is priced at about 570 Euros (~$617). 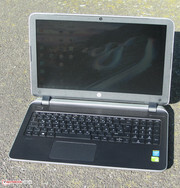 HP also offers many differently equipped models. The Pavilion uses an AMD A10-5745M (Richland) APU. Its CPU part is a quad-core processor with a clock rate of 2.1 GHz and a Turbo clock of up to 2.9 GHz. The Turbo is used in mains operation: The processor clocks at 2.1 to 2.6 GHz (multi-thread) and 2.4 to 2.9 GHz (single-thread) in the Cinebench benchmarks. On battery, all tests run with a clock rate of 2.1 GHz. The benchmark results of the AMD processor show that its performance is on par with the Core i3-4010U's. The system runs smoothly and we did not face any problems. The results of the PCMark benchmarks are also good. However, the Pavilion cannot keep up with the Acer Aspire E5-571G-520X and the Asus X555LN-XO112H, since they come with more powerful processors and faster graphics cards. It is surprising that the Pavilion performs better than its more powerful sibling. In theory, the latter should even achieve better results than the Asus X555LN. We assume that it used its Turbos hardly or not at all. The system performance of all the mentioned computers can be increased by replacing their hard drives with SSDs. The Pavilion features a hybrid hard drive from Seagate with a capacity of 1 TB and a revolution speed of 5400 rpm. An integrated SSD cache (8 GB) ensures fast loading of frequently used applications. CrystalDiskMark reports a read rate of 109.4 MB/s. HD Tune displays an average transfer rate of 90.2 MB/s. These are good values for a 5400 rpm hard drive. HP uses a graphics switch (Enduro) consisting of two AMD GPUs in the Pavilion. The integrated Radeon HD 8610G graphics core is used for everyday tasks and on battery. The dedicated Radeon R7 M260 GPU handles demanding applications like computer games. The graphics cards are switched automatically. But, the user can, and sometimes even has to, configure the graphics manually. The Radeon R7 M260 is a mid-range GPU with a clock rate of up to 980 MHz and supports DirectX 11.2. It performs significantly worse than a GeForce 840M, which is used in competitors like the Acer Aspire E5-571G-520X and the Asus X555LN-XO112H. The GeForce 830M is the direct competitor of this Radeon graphics card. The Pavilion can run many games smoothly in low resolutions and with low to medium quality settings. This is basically true for games without high hardware demands. Current top titles like Assassin's Creed Unity or Evolve do not reach playable frame rates. 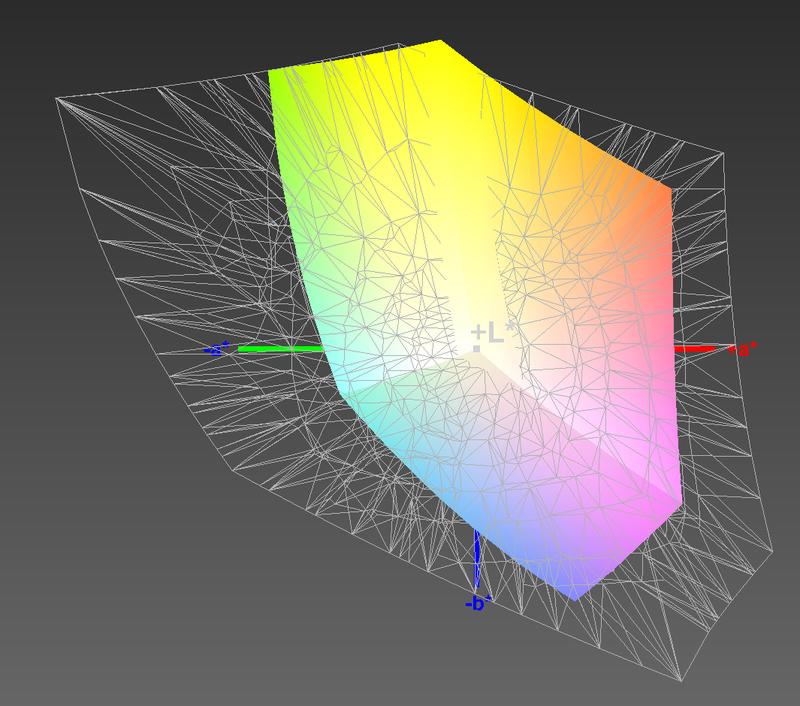 The maximum resolution (1920x1080 pixels) can also hardly be used in games. If gaming capability is a purchase criterion, you'd better buy the Acer Aspire E5-571G-520X or the Asus X555LN-XO112H. Certainly, you could also consider the Pavilion sibling. All three of them reach significantly higher frame rates than our test model. You'd need to spend more money for even better gaming performance. 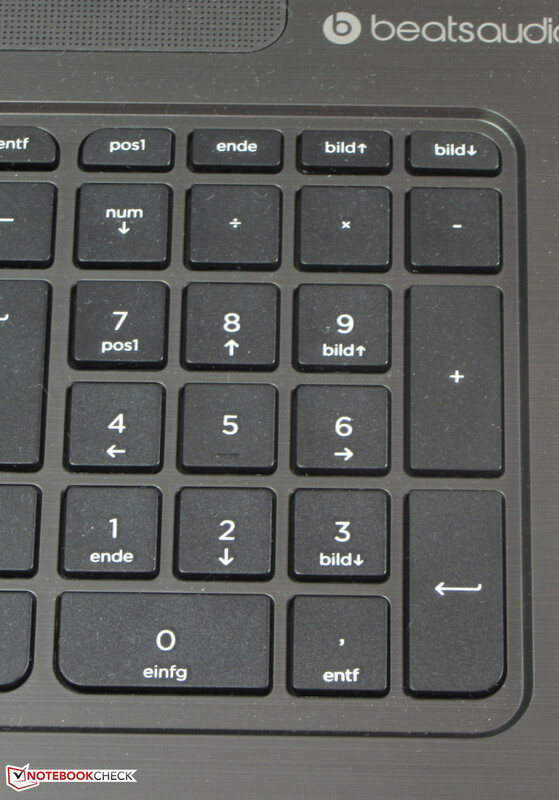 Notebooks with a GeForce GTX 850M GPU or GTX 860M GPU are recommendable in this case. While idle, the fan continuously runs at low speed. The system noise is absolutely acceptable and only audible in very quiet environments. It's different under load. The fan gets significantly louder. During the stress test (Prime95 and Furmark run for at least an hour), we measured a noise level of 49.4 dB - not a good value. The Acer Aspire E5-571G-520X and the Asus X555LN-XO112H as well as the Pavilion sibling work quieter regardless of the load. The Aspire deserves praise for its unusual low system noise under full load here. The Pavilion during the stress test. 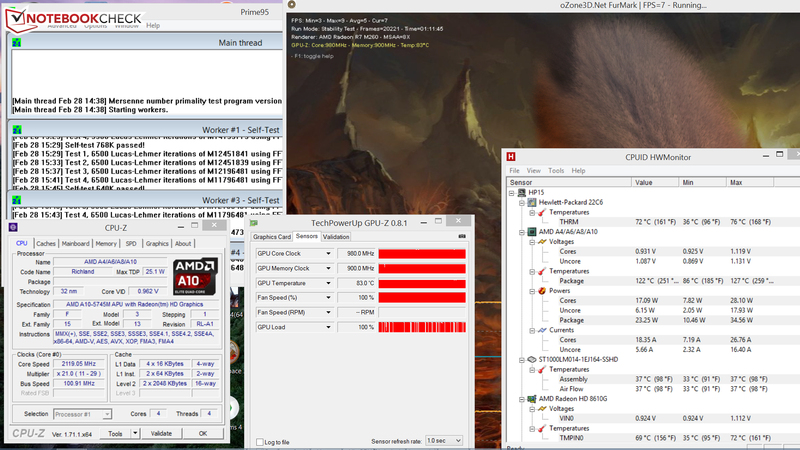 The CPU of the Pavilion clocks at 2.1 GHz during the stress test (Prime95 and Furmark run for at least one hour) in mains operations and on battery. The graphics card runs at 400 MHz (on battery) and 980 MHz (in mains operation), respectively. The case of the HP computer does not get especially warm. Two measurement segments around the fan exhaust exceed 40 °C during the stress test. (-) The average temperature of the palmrest area of similar devices was 29.1 °C / 84.4 F (-5.6 °C / -10.1 F). The Pavilion is definitely not frugal. The power consumption increases to up to 16.5 Watt while idle. The Acer Aspire E5-571G-520X and Asus X555LN-XO112H generally achieved values below 10 Watt. The same is true for the Pavilion sibling. It is not much different under load: We measured a power consumption of 73.3 Watt during the stress test. The significantly more powerful Aspire only needs 46.7 Watt (no throttling). We recorded similar values for the Asus X555LN-XO112H and the Pavilion sibling. 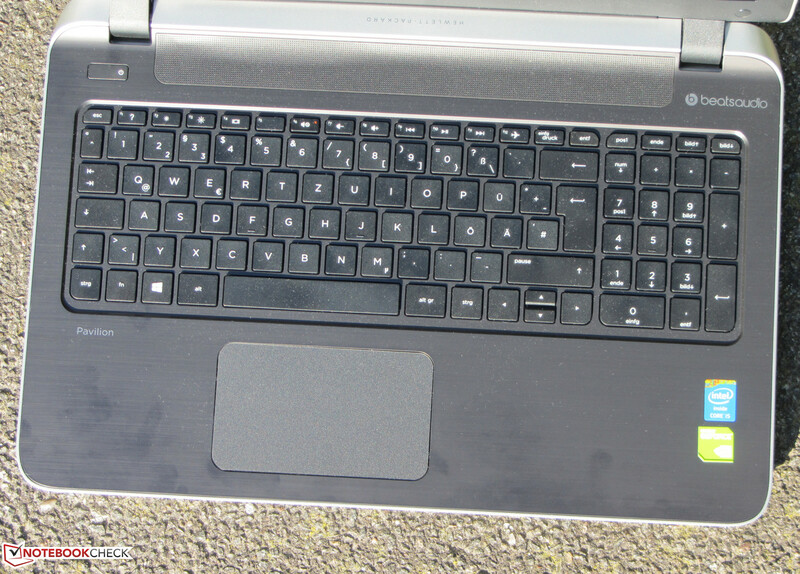 While idle, the battery of the Pavilion lasts 5:51 h. The Acer Aspire E5-571G-520X (13:15 h) can easily outperform it. 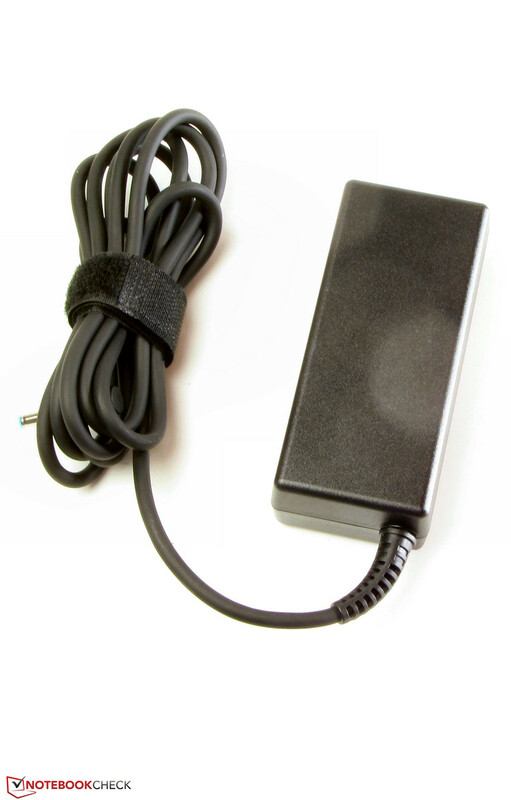 The idle runtime is determined by the Battery Eater Reader's test with minimum brightness, active energy-saving profile, and disabled radio modules. Under load the Pavilion shuts down after 1:01 h. Once again it is no match for the Aspire (2:52 h). We use the Battery Eater Classic Test, maximum display brightness, and enabled radio modules to measure the load runtime. The Pavilion completes the WLAN test in 3:01 h. It performs worse than the Asus X555LN-XO112H (4:16 h) and the Aspire (6:52 h). This test automatically opens websites in 40-second intervals. The energy-saving profile is active and the display brightness is set to about 150 cd/m². We test the video playback time by running the short movie Big Buck Bunny (H.264 coding, 1920x1080 pixels) in a loop. The radio modules are deactivated and the display brightness is set to roughly 150 cd/m². 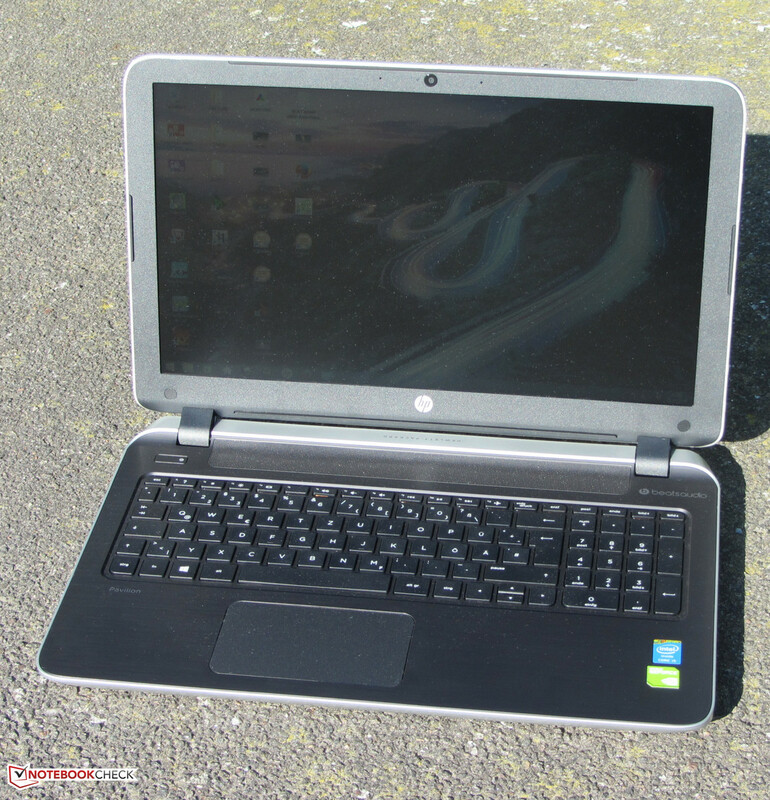 The HP notebook lasts 2:54 h. Once again the Aspire's runtime (7:04 h) is more than double the HP's. The battery runtimes of the Pavilion are awful. 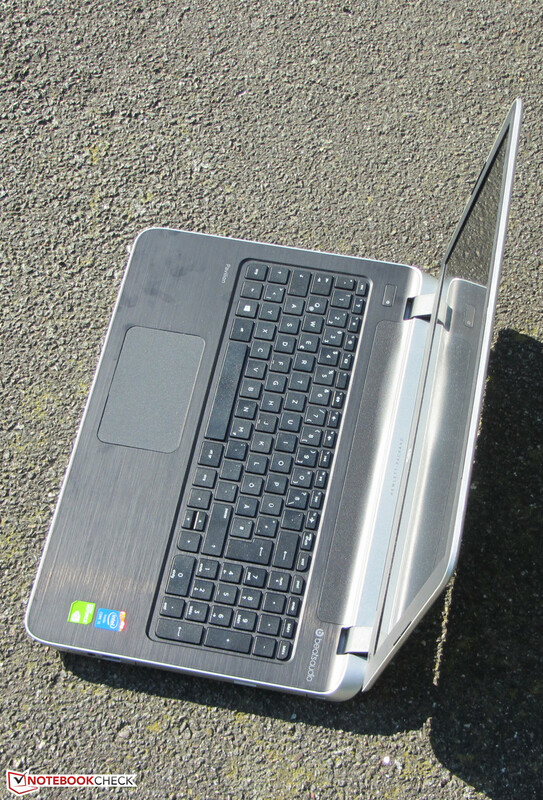 The Acer Aspire E5-571G-520X demonstrates what could be possible. Certainly, we have to mention that the Aspire has a much bigger battery capacity (HP: 41 Wh, Acer: 56 Wh). This is not an apology though, since the Pavilion also performs significantly worse than its more powerful sibling and both use the same battery. 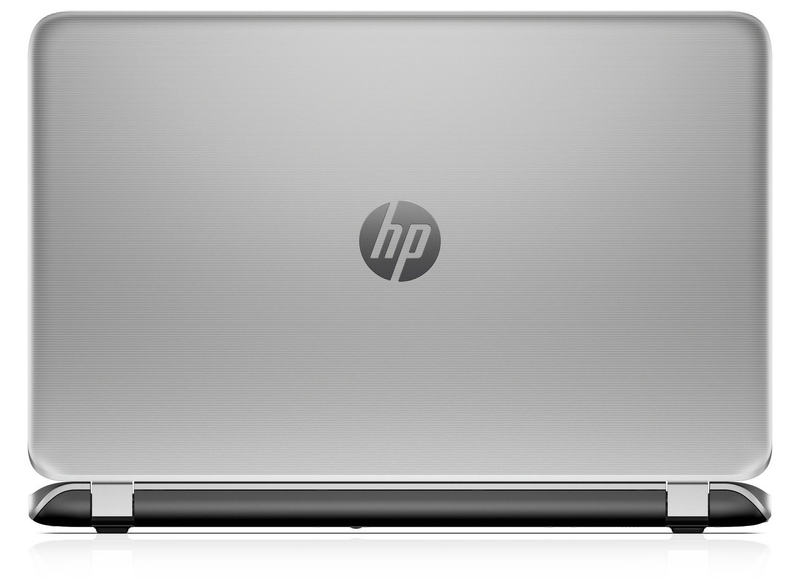 The HP Pavilion 15-p151ng delivers sufficient processing performance for everyday tasks and is capable of running certain games. The computer only gets moderately warm and works at least quietly while idle. In addition, users won't quickly run out of storage space. The matte Full HD display is decently bright, but the contrast should be higher. The Pavilion is very power-hungry. As a result, the battery runtimes are awful. Furthermore, HP only includes a 12-month warranty. We can't really see why you'd want to buy the Pavilion 15-p151ng. The Pavilion 15-p008ng (Core i5-4210U, GeForce 840M, 580 Euros, ~$628) sibling with the same design is still available and offers significantly higher processing and gaming performance as well as better battery runtimes at the same price point. The same is true for the Asus X555LN-XO112H (Core i5-4210U, GeForce 840M, 585 Euros, ~$633). The Acer Aspire E5-571G-520X's (Core i5-5200U, GeForce 840M, 650 Euros, ~$704) processing performance is even higher, and it wins against all three computers by a big margin in terms of endurance. 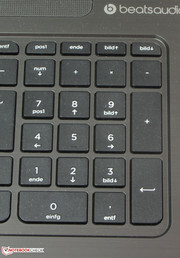 Input devices of the HP Pavilion. The power adapter weighs 453 grams and has a rated power output of 90 Watt. 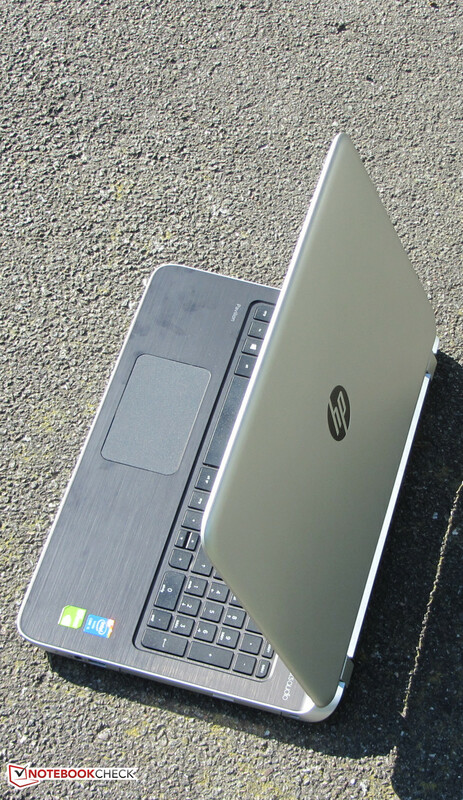 The power consumption of the notebook is much higher than many significantly more powerful competitors'. Acer Aspire E5-571G-520X, Asus X555LN-XO112H, Toshiba Satellite S50-B-12U, Lenovo IdeaPad Z50-75, HP 350 G1, Acer Aspire V 15 Nitro (VN7-571G-56NX).